If authorities feared Parsons, then it was because of what they perceived to be her dangerous rhetoric. “Learn the use of explosives!” Parsons wrote in a late 19th-century essay, imploring the laboring poor to rebel against exploitative capitalism, and those who profited from it. Despite the fact that Parsons was a virtual celebrity, followed by newspaper reporters and tracked by police, history has largely been unkind to her legacy, eclipsed in part by her husband, Albert Parsons, one of the anarchists executed in the wake of 1886's Haymarket affair. 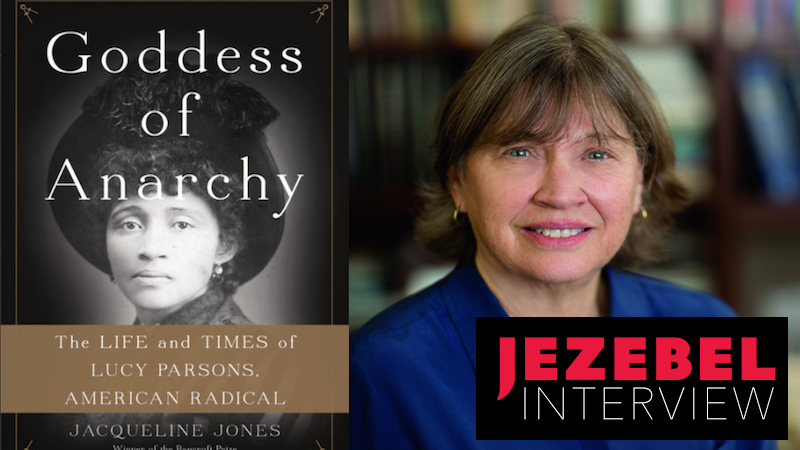 In her new book, The Goddess of Anarchy: The Life and Times of Lucy Parsons, American Radical, Jacqueline Jones revives the life and legacy of Parsons by following her from her early life in Texas to her rise as a famous anarchist. Jones describes Parsons as a “walking contradiction of terms.” As Jones deftly demonstrates, Parsons’s life was defined by ironies. Parsons was born into slavery but denied that she was black, creating instead a romantic origin story that purposefully obscured her racial identity. Likely born in Virginia, Parsons was forced to relocate to Waco, Texas by her owner (and likely biological father) in the middle of the Civil War. Once free, she sought out education and eventually met Albert, the Confederate solider-turned-Republican-turned-socialist-turned-anarchist. Unwelcome in Texas, the interracial couple relocated to Chicago where they both quickly established themselves as leaders in the labor movement and, eventually, became fierce and vocal anarchists. It was in Chicago, while Albert was on trial for his alleged role in the Haymarket bombing, that Lucy reinvented herself, claiming that she was born to Mexican and Native American parents. ﻿“Learn the use of explosives!” Parsons wrote in a late 19th-century essay, imploring the laboring poor to rebel against exploitative capitalism, and those who profited from it. It was a fiction, of course, but Parsons cultivated many personal fictions, even as her fame as a radical agitator grew. After Albert’s execution, Lucy toured the United States, imploring the working classes to take their rights by force if necessary. Her fiery and idealistic rhetoric was often at odds with her personal life. She disagreed with Emma Goldman on the issue of free love (eventually leading to a feud between the two), even as she took numerous lovers. Those contradictions extended into her family life as well. She advocated for freedom but Parsons infamously had her own son committed to an asylum because of political differences, where he would die 20 years later. Jones deftly explores Parsons’s contradictions, offering an in-depth look at a complicated woman, as well as new insight into Parsons’s surely difficult life in Texas. What emerges is a woman whose legacy is present, even if her name has been forgotten. Parsons’s work lives in our more expansive understanding of free speech and her legacy haunts contemporary debates on class, economic justice, and capitalism. I spoke to Jones about her book, Lucy Parsons, and Parsons’s enduring legacy. Our conversation has been edited and condensed for clarity. JEZEBEL: Why Lucy Parsons? What was so attractive that you decided to write this big biography? JACQUELINE JONES: I’ve been teaching American history for a while now. When I teach the survey to students I’m always interested in introducing them to interesting women in American history. Lucy Parsons name has come up in my lectures for many years, yet I was pretty reliant on a biography that was written about her in 1976, Carolyn Ashbaugh’s biography [Lucy Parsons: An American Revolutionary] It’s good, it gives the chronology of her life, but it says nothing about her origins. I got to thinking that with all of the new resources, especially digital resources, that it was time to revisit Lucy Parsons and to see if I could find something out about her background, as well as introduce her to a new audience. People today have never really heard of her. I guess I’m not surprised, but when I told people I was writing a biography of Lucy Parsons, many people, even people who knew a lot about history, said, “Who?” That’s too bad because during her time she was quite the celebrity. The news media followed her obsessively and she was known coast to coast. She was a tremendous speaker and her speaking career lasted from 1886 until she died in 1942. That’s quite a long life. You brought up that many people don’t know about Lucy Parsons. Frankly, before reading your book, I only knew about her as the widow of one the Haymarket bombers. Alleged bomber! Her husband Albert Parsons was executed in November 1887 for his alleged role in the Haymarket bombing. He did not throw the bomb. The prosecutor, the judge and the jury knew that he didn’t throw the bomb, he wasn’t even in Haymarket Square when it was thrown. He was several blocks away in a tavern. She was really a remarkable woman. Maybe we only have so much room in the pantheon of women to acknowledge a few women anarchists. In any case, it’s definitely true that her career has been overshadowed by his. Many people who do know her think of her as Albert Parsons’s wife or widow without know that she had a very long and fruitful career after his death as a public speaker, as an agitator, and as a writer and editor. She was really a remarkable woman. Maybe we only have so much room in the pantheon of women to acknowledge a few women anarchists. There is certainly Emma Goldman—with whom Lucy Parsons famously feuded. There doesn’t seem to be much knowledge about Parsons and her background. It’s too bad; she had such an interesting life, full of contradictions and full of ironies. She always denied that she had been born into slavery and claimed this false Hispanic/Native American identity for herself. She’s so interesting in so many ways. Why do you think her reputation, or at least knowledge of her, has been eclipsed by other women like Goldman, or even Mary “Mother” Jones? Certainly, their reputations have survived in histories of labor and anarchists but Parsons seems to have fallen by the wayside. Why has she fallen by the wayside while Goldman has not? I’m not really sure. Certainly, Goldman was a powerful speaker, she was an agitator, she propounded free love and she was the editor of Mother Earth. So, she was constantly in the public eye, but so was Parsons. She edited two radical journals, Freedom and Liberator, she had many speaking tours around the country. Parsons was also a prolific writer, she thought deeply about political theory and history. It’s not clear to me why she isn’t remembered. I know why Goldman is remembered—she was outspoken and deported in 1919, sent to the Soviet Union and returned from there deeply disillusioned. They have very different trajectories. As I said, Goldman was a proponent of free love, she thought monogamy was not the natural order of things. Ironically, Lucy Parsons, though an anarchist, claimed that the nuclear family and monogamy were the building blocks of a just society. When in fact, she lived a very liberated life, sexually. She had a baby in Waco, Texas and the father is unknown—it might have been Albert but it might have been a named Oliver Benton, a man who claimed her as his wife. After Albert died, she had a series of love affairs with younger men, a couple of which ended in spectacular fashion in the newspapers. She dragged them to court. On some level, she presented herself as a very prim, Victorian wife and mother and her private life, I think, was subsumed under this rhetoric. It’s quite an interesting question. I think she did pioneer resistance to efforts to suppress free speech. She was a real First Amendment proponent; certainly the efforts of the Chicago police to silence her in the late 1880s and 1890s, that was the beginning of free speech campaigns that other groups, like the Wobblies or the Industrial Workers of the World, continued well into the 20th century. Parsons was really there at the forefront of these free speech campaigns. She deserves a lot more credit historically than she’s been given. I wanted to return to Lucy Parsons’s origins for just a moment. You uncovered new information about her birth and really untangled this mess of her self-made origin story. Could you talk a bit about the challenges of tracking Parsons’s early life, from her birth in Virginia to her life in Texas? This seemed to be a contentious issue during Parsons’s career, fueled in large part by her. When Carolyn Ashbaugh wrote her book, she only devoted three pages to Parsons’s first 21 or 22 years. Ashbaugh barely mentioned [Parsons’s] years in Waco before she left for Chicago in 1873. The short part of the story is that I sat in front of a computer for many weeks and managed to track her down. I found an article in the St. Louis Globe-Democrat in 1886 which I consider the Rosetta Stone of Lucy Parsons’s life. That article gave me the name of her mother, Charlotte. It told me that her mother had married a man in Waco named Charlie Carter, it gave me the name of [Lucy and Charlotte’s] owner, Tolliver. He was from Virginia and was a Confederate surgeon who brought his slaves to McLennan County in Texas during the Civil War. It also gave me the name of the man who claimed Parsons as his wife. He was called Oliver Gathings by white people, but the name he took after slavery was Oliver Benton. All of this pointed to some real challenges to recreating her early years. One is that often after slavery, former enslaved men and women took new last names and abandoned the names of their owner. Charlotte did that, she took the name of her new husband, Charlie Carter. Charlie Carter had abandoned his slave name, Charlie Crane. Oliver Benton had abandoned his slave name, Oliver Gathings. That’s one of the challenges; to navigate these name changes over time is very difficult. But once I found the name of Charlotte, I could look her up in the Waco census for 1870 and her daughter who, in 1870, was 19. Her daughter gave her name as Lucia, again another name change because Lucia eventually became Lucy. There were these challenges to overcoming these barriers to piecing this history together. Once I knew the name of Parsons’s owner, I could find Tolliver in the Confederate military records. He was a surgeon, he was captured and sent to a prisoner of war camp in Illinois. He then went back east and got his slaves and brought them to Waco in 1863. He then becomes part of the Waco record. It was a kind of detective mystery. It was fun to see these pieces eventually fall into place, again to have them confirmed by multiple sources. It wouldn’t have made any sense to take the Globe-Democrat article at face value. I had to confirm all of that information multiple ways before I thought it was true. She would go speak and the cops would be looking around for this firebrand orator. Then she’d ascend to the stage and they’d all be amazed to find this very beautiful, well-dressed woman was the much-feared Mrs. Parsons. Lucy’s origin story or, at least the one she invents, of being Latina and Native American, seems to emerge at a very specific time. She spins this story at the very moment that her husband is implicated in the Haymarket bombing. She already has this very fluid relationship with identity, I was wondering what your takeaway on Lucy’s creation of a new racial identity is? Why is she compelled to create this particular identity? You’re right that [Lucy’s origin story] takes hold at a very specific time and that’s when Albert has been implicated in the bombing and she’s about to launch her own career as an orator and agitator. I think there are a couple of things at work here: her looks were indeterminate and she felt that she would gain more credibility on a national stage if people thought that she was not African American. I think that she thought that being labeled African American would damage her credibility as an orator on almost any subject. She approaches it as a kind of exotic identity for herself. Parsons was able to get away with it to a certain extent. People couldn’t really tell by looking at her what her origins were. Also, there was no Mexican-American press in Chicago until the 1920s or 1930s. There was nobody in Chicago to interview her or to ask her about her parents or to comment on the fact that she couldn’t speak Spanish. If you look at her through the years and see what she told census takers, she’s constantly getting her [fictional] parents mixed up—sometimes her father is Mexican, sometimes it’s her mother, other times they’re Native American. She can’t keep her own story straight because it’s a fiction. She’s not that careful about preserving it. Albert was complicit in this. He claimed later that when he met her, he found a lovely Spanish maiden on her uncle’s ranch in west Texas. Of course, they met in Waco. Popular print of Haymarket Riots, 1886. Image via Wikipedia. She took on that purpose very seriously. Certainly, she claimed that she was more native-born than anyone else—she claimed that her ancestors met Cortés when he came to Mexico. Sometimes she would say that her ancestors met Columbus when he came to the New World. Secondly, her physical appearance played a role, too. She was quite fashionable and she was very vain. Everyone agreed that she was very beautiful. She was very well put together and a very talented seamstress. The picture on the cover of the book is one of her favorites. She’s in a silk-striped dress, she has a lace collar which has a gold pin at the throat. She’s wearing a hat with black ostrich feathers. Everybody remarked on how elegantly she dressed. She would go speak in places and the cops would be looking around for this firebrand orator and they couldn’t locate her. Then she’d ascend to the stage and they’d all be amazed to find this very beautiful, well-dressed woman was the much-feared Mrs. Parsons. She had a good sense of humor, she was playing with these stereotypes of a bomb-throwing anarchist as an unshaven man from western Europe who couldn’t speak English and who was very alien to native-born Americans. The newspaper writing that you included in the book is very interesting. It’s essentially men who are both allured by her dress and the fact that she’s attractive but are also very bothered by her indeterminate racial identity. They seem very confused by the contradiction of stereotypes, between her looks and her rhetoric. There’s a bunch of ink spilled over figuring out over what her racial identity could possibly be. You call her a “walking contradiction of terms.” Do you think that’s something that she purposefully courted, perhaps to insert confusion into the coverage of her? She often claimed that her personal identity—that her background—should be irrelevant. In the Introduction, I quote her saying something like “Nobody cares about who I am or where I come from, they only care about my message.” She is being disingenuous there. On the one hand, she thought that identity should be irrelevant and the message of class struggle should be everything. On the other hand, she loved the attention. If she could make headlines, she was delighted. She craved that kind of press attention. If she could remain a woman of mystery, I think she really embraced that as a way of being in the world. I do try to make the point that I think that took a tremendous emotional toll on her. Parsons couldn’t speak freely about her background or talk about that long, forced trek from the east to Texas during the Civil War. She couldn’t be forthcoming about the family she left behind in Waco. I think that was an emotional burden that she carried with her. You can tell in the book that I wasn’t about to write another Lives of the Saints, I wanted to portray her as I saw her. She had her son committed to an insane asylum in 1899. It was shocking, he wanted to join the Army and she thought that would be humiliating to her because she was an anti-imperialist. At the time she was speaking out against the [Spanish-American War] and now, to have her own son go off to the Philippines was too much for her to bear, so she has him committed. He died in that asylum 20 years later and, as far as I can tell, she never visited him. People who met her said that she was tough. One person who met her described her as bulldozing nearly everyone. She was very sure of her own views and contemptuous of those she considered weak or ill-informed. She was a very formidable personality, but not a lovely one. Parsons also played with gender, especially the interplay of gender and her incredibly violent rhetoric, which included encouraging crowds to make dynamite and engage in this anarchist war. She used gender to protect herself, or at least ward off suspicion, during Haymarket but also to garner support. As you pointed out, she’s very invested in her appearance as another method to undermine stereotypes. I was wondering, how does gender work either for or against Parsons? Especially considering that she’s not a white woman and the press is very invested in determining her racial identity— while they might not be sure of her race, they are sure that she’s definitely not white. Her politics were, as you say, pretty violent. I looked at what she wrote in her husband’s paper, The Alarm, before Haymarket. She is one of the proponents of the use of dynamite. There developed a cult of dynamite among anarchists in Chicago in the mid-1880s. They argued that it was the ultimate form of self-defense for the laboring classes and also that it leveled the playing field. They argued that if they had to deal with well-armed police or businessmen backed up with Gatling guns, then they needed dynamite to protect themselves. Often this rhetoric veered away from self-defense to calling for the use of dynamite as a weapon in class warfare. She contributed to this. Authorities in Chicago loved to use words to describe her that invoked the Great Fire of 1871. They said she was a firebrand, that her comments were inflammatory or incendiary, that she was bound to unite the spark of revolution, and set the laboring classes on fire. There are all of these firey allusions to her. It was interesting that during the Haymarket trial, the prosecution introduced many different kinds of evidence and one piece of evidence was her essay called “Two Tramps.” The essay ends with the sentence, “Learn the use of explosives!” She had a very demure personal presentation, all the while, her writings were very provocative. Authorities in Chicago loved to use words to describe her that invoked the Great Fire of 1871. They said she was a firebrand, that her comments were inflammatory or incendiary, that she was bound to unite the spark of revolution, and set the laboring classes on fire. There are all of these firey allusions to her. After the Haymarket trial, the police detective Michael Schaack, who was the great nemesis of Chicago anarchists, was asked if he would go after the women next. The question referred to Lucy Parsons and Lizzie Swank [another anarchist and close friend of Lucy and Albert]. People often complained that Lucy got away with this murderous rhetoric only because she was a woman. And, to a certain extent, she did. Her husband was executed basically for saying things that she said as well. His writings were very provocative and very violent. He denied that later on, but that was certainly the case. When they were looking for suspects for the bombing, he and other editors and orators were rounded up—the usual suspects, I guess. It is interesting that she was kind of inoculated against a kind of vigorous prosecution. She also has a really fraught relationship with gender. She used a lot of gendered language in her speeches—challenging men to be men, for example. But when she’s working with the Working Women’s Union, she’s also deeply frustrated by these attempts to unionize and mobilize working women like herself. This history of working women often goes unexplored in big histories of labor and anarchism. I was wondering if you could speak a bit about Parsons, the Working Women’s Union, and the organization of women in that period? First of all, I should point out that Parsons was more of an agitator than an organizer. She didn’t really have the patience to work with ordinary laboring women. She wanted to get up in front of a big crowd and declaim. The experience with the Working Women’s Union she found instructive because she found that it was not going to be her destiny. The problem with that group is that it was composed mostly of middle-class women who were well-educated and well-read. They were very interested in political theory and would have meetings at night where they would discuss fine points of political ideology. Parsons didn’t seem to understand that working women—women who toiled as seamstresses or domestic servants for ten or twelve hours a day—were really not interested in that kind of evening activity. Lucy Parsons, 1886. Image via Wikipedia. They weren’t eager to commit to a union because they considered wage work to be temporary. They didn’t think that they would be doing this forever. They believed that they were doing this labor until they got married and then they could retreat from the paid labor force. Lizzie Swank found this out, too (she and her sister worked as labor organizers in what was essentially a sweatshop). They found that it took a lot of courage to walk out; these women would have been fired if they walked out of their jobs, left without pay, and likely blacklisted. These women just didn’t have the emotional resources to confront their employers and demand higher wages. It was a really brutal system. It is true that these women were getting a lot of discouragement from their brothers and father who believed that women should not be working because they depressed the wages of men. They were encouraged to think of labor as a temporary state. Beyond that, they’re tired at the end of the day, they want to spend their Sunday afternoons relaxing and not going to union meetings. Parsons loved the debating and talking about political history. She was extremely well read and really enjoyed in-the-weeds discussions of political theory. Working women had no patience for Parsons’s approach. She made no headway and the Working Women’s Union collapsed very quickly. It was a struggle to organize women in the garment industry well into the twentieth-century, until the 1930s, and even beyond. One of the thing that’s still a bit of a mystery is how and when Lucy Parsons becomes so radical. You follow her in Texas, and we know she’s in school at some point. She marries Albert and, because of racial and political discrimination, they move to Chicago. At what point does Lucy herself turn from a newly free woman with a child at home to a radical firebrand encouraging workers to make dynamite? If we take her at her word, it was Great Strike of 1877. It was the summer of 1877 when railroad employees across the country went on strike and other workers joined them in solidarity. In Chicago, the strike was a very bloody one, it lasted about a week and several people were killed. Albert was a major figure that summer because of his rhetorical abilities. He gave several speeches to large crowds. That was the first time he really came to the attention of the authorities in Chicago, including the police and powerful businessmen. Lucy Parsons says that that experience radicalized her. She realized that capitalism was predatory, that the police were aggressive in their violent attacks on workers and that the laboring classes must defend themselves at all costs. I see her starting to contribute to a magazine called The Socialist in Chicago in the late 1870s and then she continues to write for other periodicals. The Alarm started in about 1884 and she begins writing there. You can tell from her writings that she’s reading a lot during that period. Some of her writings for The Socialist indicate that she’s reading popular women’s magazines, as well as local newspapers, and dense political theory. She’s self-taught but she’s clearly brilliant—she had to be. She only had two or three years of formal education in a school with other children of [formerly] enslaved people. That was a rudimentary kind of learning that she got there. She read a lot her own; there was a lot of study groups, the Socialists were very big on meeting in the evening and discussing very dense tracts of political theory. Albert and Lucy were very involved in that. When you read Parsons today, it really does sound like she is talking about our current time. She really was quite prescient. Now that you’re done with this project and the book is out, what do you think Lucy Parsons’s legacy is today? She was a fearless speaker. At one point, I suggest that she was never happier than when she was dodging the police. She did it so often, I came to believe that she came to relish it—it was something awful that she had to contend with, but it became part of who she was. Getting on stage or standing on a street corner and having the police tell her to move, then going to another street corner or spending the evening in jail—that meant that she was fearless when it came to speaking her mind. When you look at the late 80s and 90s in Chicago, she’s giving speeches and the cops are demanding that she show the American flag when she speaks, and she refuses. Instead, she shows the red flag or the black flag, or anything to aggravate and antagonize the cops. When I think of Chicago’s Red Squad—an elite group of police officers who were supposed to keep track of radicals in the city—I think she was really an impetus for the formation of the Red Squad. Certainly, after the Haymarket trial, the police become very convinced that they have to monitor all radical activities in the city. She knew whenever she spoke that there were undercover police in the audience. She knew that detectives followed her. I see her as a fearless proponent of the First Amendment. She also demonstrated a great deal of physical courage, as well. She was very prescient. She warned against machines taking people’s jobs. She warned that, as machines took jobs, no one would be able to buy anything or sustain the U.S. economy—she turned out to be half right about that. She called out both political parties, she didn’t think they were adequate to address the nation’s ills; she was right about that. She decried the role of money in politics, saying that money corrupted the political process. She was right about that. She’s really identifying the growing gap between the rich and the poor and the dispossession of so many workers. When you read her today, it really does sound like she is talking about our current time. She really was quite prescient. But the personal life is filled with ironies and contradictions, and that’s what makes her so fascinating. She had a rich and turbulent life and she tried to smooth that over in her public persona. It’s just who she was. In the classical Marxist sense, at least in the 19th century, she felt that her focus should be on the urban laboring classes, particularly factory workers. She and her husband, virtually all of their comrades in Chicago, ignored the struggles of black working people. It’s not just because she was born enslaved that I think she should have been more attentive to that community but, as positioning herself as a radical, she and her comrades should have really understood the very difficult position that black workers were in. As it was, these white agitators and labor organizers, they demonized black workers as strikes breakers, the same way they demonized the Chinese as workers who would take low wages and put white workers out of jobs. That was a very short-sighted way of looking at the laboring class. That’s, unfortunately, part of the legacy of American radicalism and, of course, Lucy Parsons.